England's three matches at next month's inaugural SheBelieves Cup will be broadcast live on the BBC. The Lionesses, who finished third at last year's World cup, take on Germany, France and host nation USA at the tournament, which begins on 3 March. Head coach Mark Sampson will announce his 23-player squad on Monday. He said: "It's great news that the BBC is showing our games and giving our supporters the opportunity to follow us out in America." England's opening game against World Cup winners USA in Tampa will be live on BBC One on Friday, 4 March (kick-off 00:45 GMT). The second match against European champions Germany in Nashville on Sunday, 6 March (22:45) and the final game against France in Boca Raton on Wednesday, 9 March (22:00) will be shown on the Red Button and the BBC Sport website. 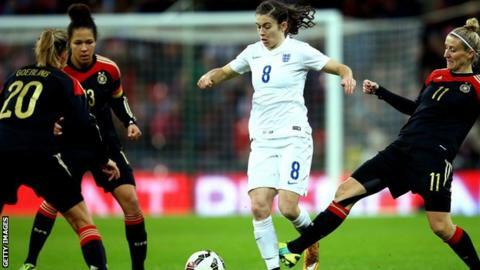 England's subsequent home match, a Women's Euro 2017 qualifier against Belgium on Friday, 8 April (19:55), will be broadcast live on BBC Two. Sampson added: "We are playing the best of the best in this tournament and we know they'll be tough, exciting and entertaining games which will help develop our squad even further and stand us in good stead for our Euro qualifying campaign."